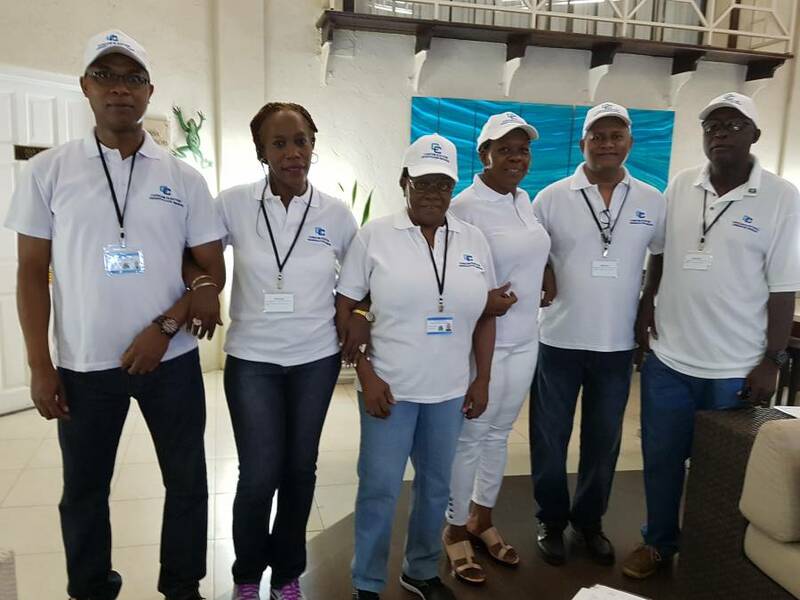 CARICOM Election Observation Mission -Brian Bellevue, CARICOM Secretariat; Pauline Welsh, Chief of Mission, Jamaica; Dianna Greenidge, Barbados; Dora James, St Vincent and the Grenadines; Ravi Lochan, Trinidad and Tobago; and Gordon Clarke, Guyana. At the invitation of the Government of Grenada, the CARICOM Secretariat constituted an eleven-member team to observe Grenada’s Parliamentary Election held 13 March 2018. The mission was led by Pauline Welsh, Director of Legal Affairs, Research and Development at the Electoral Commission of Jamaica and comprised observers from The Bahamas, Barbados, Guyana, Jamaica, Saint Lucia, St Vincent and the Grenadines, Suriname and Trinidad and Tobago. (iii) collect qualitative observations regarding the voting process, comportment of the electoral officials and political actors, and on the overall electoral environment. The group is seized of and operated with the knowledge that it has no executive role and is therefore mandated to act impartially and independently upholding the standards of international election observation. Against the backdrop of its mandate the CARICOM observation team holds the belief and the profound recognition that an election is not merely a singular event, but a process, the importance of which must be assessed in its entirety, to determine the extent to which the standards of credible elections have been achieved. The team notes the various public expressions and utterances that based on its arrival in Grenada, there would be limitations in its observations and conclusions. This is because of the fact that the team did not observe the registration and other processes leading up to the elections. With this consideration and as part of the CARICOM’s observation methodology, the Chief of Mission and the representatives from the CARICOM Secretariat sought to meet with key stakeholders prior to 13 March. Those meetings continued even after the arrival of the main group and were held with the purpose of gathering information on the emerging issues and concerns and the overall impact if any on the electoral process. The CEOM is seeking to confirm the information gathered and will make further comments on these issues and present its analysis in its final report to the Secretary-General. Observation of the taking of the polls was carried out in 130 polling stations across 13 constituencies including Carriacou and Petit Martinique. Each team observed the vote tabulation process in one polling station and followed the results being inputted at the Parliamentary Office in the constituency to test the integrity of the Elections Results Management System. The polling stations were opened on time in the instances observed. There were long lines leading to the polling stations and in some instances the electors could not easily identify their polling stations despite the presence of marshalls who were at the polling location. In several cases it appeared that the marshalls could not keep pace with the influx of the crowd, in other instances, the marshalls seem to blend with the crowd and could not be easily identified even though they were properly identified by wearing identification cards. The team is of the view that a different mode of attire to include the wearing of a brightly coloured vest would enhance the presence of the marshalls. Also making more marshalls available at locations where there are several polling stations. In addition to the presence of the marshalls to direct persons to their polling stations, the team observed that signage was provided to inform the electors of where to vote. However, in several instances, the signage was not prominently mounted, and there were instances of electors joining the wrong queue despite the presence of the signs near or at the entrance of the polling stations. Persons actually stood in lines for long periods only to eventually discover that their vote was in another station. In the morning there were long queues, and in some instances, the electoral officials were rather slow in executing the procedures which led to the electors complaining bitterly that the long wait was frustrating and that it was taking too long to process one elector. Throughout the course of the day voting progressed smoothly in a peaceful and orderly environment. There was adequate security presence which was neither oppressive nor intimidatory and in the main contributed to the electors exercising their franchise in a peaceful environment and in an orderly manner. Generally, the procedures appear to have been followed. The electoral officials were courteous and displayed professionalism in carrying out their duties despite variations in carrying out specific procedures and in the application of the law. The team notes, however, that there are some procedures and areas that require strengthening not only to improve efficiencies but for advancement of electoral reform and for building greater public trust in the process. One such area relates to the use of the voter identification card and those procedures that are employed for voters who attend the polling stations without their voter identification card. The team observed that in the days leading up to the election the information made available to the electorate from the election authority and from elsewhere in the media was that one could vote without the card, and this is rightly so. Not much encouragement was given to electors to attend with the card. There seems to have been a greater focus on the fact that electors could vote without the card leading to the creation of an impression that the card was not a necessary requirement to identify the voter before issuing the ballot. The CEOM further observed that in a few cases the elector(s) on their initiative presented another form of identification or a National Insurance Card. The CEOM is aware that the law allows for a person whose name is on the list of electors to vote without the presentation of an ID card if he/she satisfies the presiding officer that he/she has not been issued with an Identification Card or that he/she has been issued with an I.D. card that is lost or destroyed (Section 44A(5) of the Representation of People Act). The CEOM observed that in a number of instances once the name was on the list, the presiding officer proceeded to issue the ballot without seeking to do anything further to achieve the satisfaction required under Section 44A(5) of the Representation of People Act. In the interest of safeguarding the integrity of the voting process and as a preliminary recommendation to strengthen the process, the CEOM would like to propose that attention be paid to this area of the law to strengthen its application either by developing administrative procedures as a complement to what presently exists or by amending that Section to prescribe the exact procedures to be undertaken to conclusively identify voters who do not have a card. Additionally, each elector’s demographic record should be made available in the polling station to assist the presiding officer in achieving satisfaction of an elector’s identity in instances where the card is not available. Another preliminary finding of the CEOM is that the indoor agents of the candidates in many instances appeared not to be fully engaged in the process. Specifically, the team observed that the indoor agents are not given any documentation verifying the results of the vote tabulation process in the individual polling stations. The team believes that there is room for improvement in this regard to promote greater transparency. It, therefore, wishes to make a preliminary recommendation that this aspect of the law among other areas of the Representation of Peoples Act be revised to allow the agents to receive signed copies of the Preliminary Statement of the Poll. It is normally a good practice to after each electoral cycle conduct a review of the procedures against the background of the electoral framework with the aim of strengthening the electoral process. The CEOM believes that such a review is timely. Based on its preliminary assessment the CEOM finds that greater efforts or more effort need to be put in place to achieve meaningful reform and greater efficiencies in the registration of voters to ensure that the Voters List is accurate, reliable and up-to-date. The CARICOM Election Observation Mission wishes to congratulate the people of Grenada on their commitment to the democratic process evidenced by the voter turnout and the peaceful manner in which the people exercised their franchise. The CEOM would also like to commend the Electoral Authority for organising the process and the performance of the polling officials who displayed professionalism in carrying out their duties. To the security forces, commendations are also in order for the maintenance of an orderly polling environment to facilitate the free expression of the will of the people.